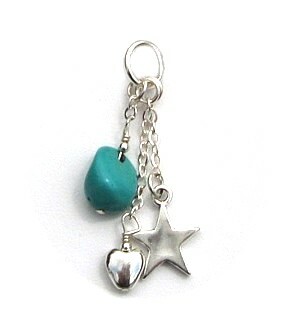 Totally divine cluster pendant, complete with Sterling Silver Star , Heart and chunk of Turquoise. Since the dawn of their time on earth, the Navajo lived beneath a glorious canopy of shimmering stars which they used to guide them and inspire them with magical powers of warmth and brilliance. Wear this cormic charm on its own on a chain. Or clip onto an Affirmation ring for even greater impact. For a chunkier look add more Spirit Charms.